"What you have to do here is take fate in your hands and wrestle it to the ground." 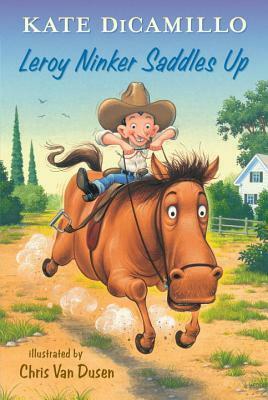 In Leroy Ninker Saddles Up, Kate DiCamillo (author of Because of Winn Dixie) introduces us to Leroy Nicker, a small cowboy who dreams of owning a horse. It's love at first sight when he meets Maybelline, a rather large, and rather spoiled, equine. Leroy's first hilarious adventure with Maybelline proves that a cowboy will do anything for his horse, including "wrestling fate to the ground." At 96 pages long, this book is the perfect beginning chapter book and a quick read. It is apparently a spin-off of the "Mercy Watson" series, which I am not familiar with, and the first in the new "Tales from Deckawoo Drive" series. With cartoon-like illustrations from Chris Van Dusen, Leroy Ninker should be a hit with beginning readers.